George Oswald Browning Allen, always known as ‘Gubby’, was born in Australia in 1902. His family brought him to England at the age of six and, after being schooled at Eton, he made his debut for Middlesex in 1921 before beginning studies at Cambridge University. A couple of years was time enough for both the University and Allen to realise that, although he was a fine sportsman, Allen was no academic, and he moved into employment in the City of London without graduating. In view of controversies to come Allen’s Australian background is of some relevance to his story. After emigrating to Australia in 1857 Allen’s grandfather was one of the founders of an Australian law firm that, now known simply as Allens, is a multi national practice and one of the most prestigious in Australia. Allen’s own father qualified as a barrister, but never practised. . There were funds enough to pay for Allen’s education, but after he left Cambridge he needed to support himself, so he began work as an underwriter for a major insurer. After that he moved to France for a time, before taking a position with the department store, Debenhams. Finally in 1933 Allen moved to the Stock Exchange, where he spent the rest of his working life. None of his various employments allowed him to play a full English season, but he had varying amounts of free time, and was able to secure sufficient leave to enable him to tour Australia in 1932/33 and 1936/37, as well as the Caribbean in 1947/48. Had he played regularly Allen might now be remembered as a great all-rounder. In fact his limited availability meant that he never managed either 1,000 runs or 100 wickets in a season, but he was still a decent player and his record on his two tours to Australia, when of course he was able to fully devote himself to the game, suggest that he been able to play full time he might well have ended up with an outstanding First Class record. With the bat he was a useful lower middle order batsman. Essentially of sound technique, as would be expected from the man who was a driving force behind the 1952 first edition of the MCC Coaching Book, he was nonetheless capable of scoring quickly when the state of the game required. In his 25 Tests he averaged 24.19 with a century and three fifties. With the ball Allen was a right arm fast bowler, and he could be genuinely quick. Not dissimilar in height and build to the great Harold Larwood Allen was not too far behind the Notts Express in pace. Footage from the bodyline tour gives a clear indication of his pace, and bowled very well throughout both his Australian tours. In 1929, playing for Middlesex against Lancashire at Lord’s, Allen became one of the few fast bowlers to take all ten wickets in an innings, on that occasion for only 40 runs, with eight of his victims clean bowled. Lancashire were a strong side in those days, seven of the ten men dismissed by Allen being Test players. The ninth of Allen’s victims was the great Australian quick bowler Ted McDonald, who was stumped. Lest therefore anyone doubt the pace at which Allen was bowling it is worth making the point that wicketkeeper Fred Price was stood back at the time. Having been hit on the thigh by Allen’s previous delivery McDonald decided to come down the wicket to Allen who, noticing what he was doing, bowled a slow wide one which went through to the advancing Price who was able to throw down the wicket before McDonald got back. The Times’ correspondent described what he saw that day as a truly exhilarating exhibition of fast bowling. The 1929 England opening attack had been established the previous winter when the Ashes had been retained by a convincing 4-1 margin. The twin spearheads were Larwood and Maurice Tate but, with both out of the fourth Test against South Africa Allen expected to make his Test debut, and was bitterly disappointed when he was not selected. The following year brought a visit from Australia, and the longed for international debut for Allen. He was chosen for the second Test at Lord’s after Larwood was forced to withdraw. His batting form was non-existent, as he had scored just 47 runs in seven completed innings that summer, but he had been bowling well, and importantly had taken Australian wickets in both his meetings with them. Allen’s home ground greeted him with a perfect batting wicket however and, as Australia scored more than 700, his figures were 0-115. 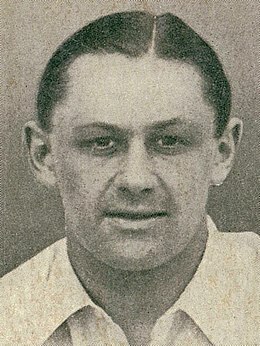 His debut was not wholly anonymous however as in the England second innings he scored 57 as he and his captain, Percy Chapman, at least held up the Australian victory. Allen was not selected for any of the remaining three Tests. In 1931 Plum Warner joined the selectors. Warner was enthusiastic about Allen’s talents and indeed suggestions have in the past been made that Warner was Allen’s father. It is certainly the case that Warner had been an admirer of Allen’s mother and did know her in Australia, but sadly for an entertaining theory according to his biographer Warner was in France at the time Allen must have been conceived. Ironically enough in light of what was to come Warner was, at this stage, also a great admirer of Douglas Jardine and was instrumental in his appointment as captain for the three match series against New Zealand in 1931, the first Tests between the two countries in England. In the first New Zealand earned a draw and indeed at one stage were in charge of the game. Only an eighth wicket partnership of 246 between Allen and Les Ames got England back in the match, and Allen’s 122 was to remain his only Test century. He picked up some wickets in the second Test, which England won by an innings. In the third Test, ruined by the Manchester weather, Allen was not called upon to bat or bowl. In the eight First Class matches he managed in 1932 Allen achieved little with the bat, and his bowling figures were little more than adequate, but his was amongst the second tranche of seven names selected for the 1932/33 tour. Most observers at the time assumed that Allen would once more be cover for Larwood. In the event both men played in all five Tests. Allen famously refused to bowl Bodyline and during a furious argument before the second Test told Jardine that if he (Jardine) didn’t like the way he bowled he should leave him out of the side. Having contributed next to nothing to England’s win in the first Test it is perhaps surprising that Allen did then play in the second Test, especially as one of a four man pace attack with all of the party’s three spinners as well as medium pacer Tate sitting the match out. In the end Allen came out of the Bodyline furore rather well. He certainly irritated Jardine, but that apart he offended no one. Those who supported Jardine did not think ill of Allen who had, after all, just stuck to his principles in the same way as his skipper, and that apart had kept his own counsel on the subject. In addition he proved to be an important member of the side, taking 21 wickets at 28.23. Only Larwood took more wickets and whilst there were no major scores for Allen he also averaged 23.28 with the bat and made some useful runs. He also kept on the right side of most of Australia, and of those in the influential MCC Committees who were charged with the difficult task of sorting out the mess. But was Allen guilty of hypocrisy and looking after his own interests? He was desperately keen to retain the popularity he had in Australia as a result of having been born there. There is also a school of thought to the effect that the real reason for his reluctance to bowl Jardine’s leg theory, or at least a contributory factor, was his fear that he would fail. At the time he first articulated the reason for his refusal to comply with Jardine’s instruction his only experience in the Tests was taking one tail end wicket, and getting a hammering from Stan McCabe during the latter’s memorable unbeaten 187 in the first Test. Allen was adamant in a BBC interview half a century later that he could have bowled Bodyline, but he was never renowned for his accuracy in the way that Larwood and Voce were and one wonders now whether his concern was more, after his experience with McCabe, about being savaged again as Bradman returned for the second Test. Another question that Allen never satisfactorily answered is why, if he so objected to Jardine’s leg theory, he appeared to have no qualms about fielding in the leg trap, where he held six catches over the course of the series. It must also be the case that had Allen ever publicly proclaimed his views about Larwood and Voce his reputation would have been irreparably tarnished. In a letter home to his parents he wrote of swollen headed, gutless, uneducated miners. Allen also knew Jardine pretty well, and no doubt rightly concluded that other than in the short term his future would be better served by keeping on the right side of Warner, rather than Jardine. It also seems likely that Allen, for his own purposes, played up the rift with Jardine. Whilst Jardine himself was nobody’s fool, he was very much his own man and he had no reason at all to write a letter to Allen’s father unless he genuinely wished to do so. That he felt able to write GO Allen set a truly magnificent example to the side ……. an excellent tourer in every way, is hardly the comment he would make of a team member who had caused him any irritation. Over the three English summers that followed Bodyline, whilst he developed his career on the stock exchange, Allen appeared in just three Tests. In Larwood’s absence he was persuaded to appear in the first Test against the 1933 West Indians where he took three cheap wickets in a comfortable England win. He was less successful in his two Tests against the 1934 Australians, but he was not fully fit, and then he missed the whole of the international summer against the 1935 South Africans after a leg injury. There can be no doubt that Allen was desperately keen to captain the next side that was due to visit Australia in 1936/37, and he was always going to be a leading contender for the appointment. He himself told Michael Marshall (but not his biographer Jim Swanton) that there was some concern at Lord’s about giving the captaincy to a fast bowler rather than a batsman. There was, according to Allen, a selector who was putting forward the name of Claude Ashton as a potential skipper and indeed Ashton played more county cricket in the summer of 1936 than in any other summer. He was a batsman and, educated at Winchester and Cambridge University, very much of the right background, but at 35 Ashton had no Test experience nor much in the way of captaincy experience. Allen rightly considered himself in a strong position and told the MCC that he would not tour under Ashton. Something Allen must have been aware of, but chose not to discuss with either Marshall or Swanton, was the other candidate, Cyril Walters. A fine amateur batsman who had averaged more than 50 when opening in all five Tests of the 1934 Ashes series and who had led his county, Worcestershire, for a number of years, the 31 year old Walters, even given that his alma mater was Neath Grammar School, was an outstanding candidate. Unfortunately for the selectors however he had retired from the game the previous year, his wealthy bride not caring for the game of cricket. Walters was asked to come out of retirement to lead the tour but Mrs Walters was no keener on travelling round Australia than she was on the county circuit, so the offer was declined. The failure by Jardine’s deputy, Bob Wyatt, to retain the Ashes in 1934 and defeats in West Indies in 1934/35 and at home to South Africa the following summer left Allen as the man MCC turned to. Other candidates were Erroll Holmes of Surrey and Yorkshire’s Brian Sellars, but with Warner fighting his corner Allen’s appointment was no surprise. The 1936/37 series has a unique place in the history of the Ashes in that it is the only occasion on which either side won the first two Tests only to go on to the lose the series. In the first Test Allen played a starring role in England’s victory with both bat and ball, scoring 35 and 68 and taking 3-71 and 5-36. He bowled well in the innings victory in the second Test as well before his form tailed off in the three defeats. He could barely buy a run in those matches and took just five more wickets in total although, in fairness to him, he was certainly not fully fit for the fifth Test. The general feeling was that Allen was a sound tactician. It is difficult by virtue of the outcomes of the matches to criticise his decisions in the two victories, and whilst England were fortunate with the weather, Australia on both occasions getting the worst of the conditions, that particular factor had evened itself out by the end of the tour. One decision that did attract criticism came in the third Test, when the tide turned. This time it was England who got on the wrong end of an MCG sticky and, in response to Australia’s 200-9 declared found themselves on a treacherous wicket and slumping to 76-9 before Allen declared. Bradman then reversed his batting order and there was time enough for England to take just one wicket before the close. After that the wicket dried out and Australia ran out comfortable winners. If Allen had declared half an hour earlier, with the wicket still at its worst, England might well have had half the Australians out before the close, and gone on to clinch a series victory. To declare in a timeless Ashes Test whilst 150 behind is clearly a tough call, and hindsight is a marvellous resource, but already 2-0 up in the series it was perhaps a gamble worth taking. The stressful life of a touring captain must however affect clarity of thinking in the making of such decisions. That Allen was already feeling the pressure is clear from a famous incident in the second Test. In the Australian second innings the home side were following on 346 behind. With Bradman and Jack Fingleton at the crease Allen’s Middlesex teammate and fellow amateur Walter Robins failed to hold on to a catch Bradman offered him at square leg. Not all the press even described it as a chance but Robins undoubtedly got a hand to a chance that one writer described as smoking hot. Not unnaturally Robins nonetheless apologised to Allen later, only to be greeted with a response to the effect of; Don’t worry about it Walter, you’ve probably cost us the Ashes, but don’t give it another thought. The pair were good friends, and the explanation for the comment given by Swanton is that the comment was intended as a joke. That it wasn’t is evidenced by the fact that the incident was never described as such by Robins, not a man who could ever be accused of lacking a sense of humour. The clincher though is the vehemence with which Allen wrote home to his parents, declaring that Robins had missed a ‘sitter’. Another telling point as far as Allen’s overreaction is concerned is of course the state of the game at the time. Australia were still well behind and lost by an innings and 22 runs, and whilst Bradman was always more likely than anyone else to help make up such a huge deficit as the innings developed that never looked likely. Later in the tour Allen was also caused much anxiety by Australia selecting Laurie Nash for the final Test. An outstanding Australian Rules Footballer Nash was also a fearsome fast bowler who, as a result of what was perceived to be a poor attitude, had a very limited cricket career. Allen was concerned that Nash’s bowling would be unfair and he approached Bradman and then the Australian Board in order to try to persuade them to drop Nash. His efforts failed and Nash played. In the event he bowled perfectly fairly, and made a not insignificant contribution to Australia’s victory. Despite that however, and only being 26 Nash never played First Class cricket again. On his return business claimed Allen for almost all of 1937 and Robins led England against New Zealand, but Allen hoped and in all probability expected to be reappointed to lead England against Australia in 1938. With his 36th birthday approaching it would be his last chance to lead against the old enemy at home. His rival was something of a surprise, Walter Hammond. Undoubtedly England’s finest batsman over the previous decade Hammond, who was always somewhat aloof from his fellow professionals, had ‘married well’ and chosen to turn amateur. With Warner in his corner Allen was favourite to get the job, but he managed to offend his old mentor early in the 1938 season. Warner tried to persuade Allen to turn out for the MCC against the Australians. Warner probably could have taken being told by Allen that he didn’t feel fit enough, but was very upset when Allen, no doubt somewhat testily, told Warner that he didn’t understand fast bowlers. When Allen was then invited to captain ‘The Rest’ against England in the Test Trial he cried off with an injury, possibly genuine, but he certainly felt he should have been leading the team styled as England rather than ‘The Rest’. Hammond got the job. The intervention of the Second World War seemed to have put an end to Allen’s Test career, although in fact he led England once more, to West Indies in 1947/48, by which time he was 45. No longer an effective bowler, although that seems more to have been a result of being so injury prone rather than being unable to bowl at a decent pace if he wanted to, it was a trip that, measured purely in terms of cricketing achievement, he should not have made. Despite not being fully fit himself injuries to others meant Allen played in three of the Tests and if his contributions were modest he certainly didn’t disgrace himself. The tour ended in defeat however, MCC having seriously misjudged the strength of West Indian cricket, and the four match series was lost 2-0 and in fact the Englishmen did not win a First Class match all tour. After he returned from the Caribbean Allen became an increasingly important figure in the game’s administration. He made a success of stockbroking and a substantial inheritance meant he had plenty of opportunity to fill the roles, at various times, of committeeman, president and treasurer of the MCC as well as a Test selector. The sort of man Allen was can be judged by his views on many issues. He opposed the abolition of the distinction between amateurs and professionals in 1963. A few years later he opposed the relaxing of the qualification rules to enable overseas players to sign for counties and, best remembered of all, he was one of those who sought, initially successfully, to keep Basil D’Oliveira out of the side selected to tour South Africa in 1968/69. Unsurprisingly Allen was, it would seem, something of a snob. His comments about Larwood and Voce are the perfect illustration of that, and another former miner Les Jackson, day in and day out the best quick bowler in England through the 1950s, had Allen to thank for not playing in a single Test during that decade, the two appearances he did get being as far apart as 1949 and 1961. A man who had little time for Allen was, inevitably, the supposed ‘Bad Boy’ of English cricket, Frederick Sewards Trueman. Interestingly there is really only one story about the pair, that being about how humiliated Trueman felt on an occasion in the nets when, with members of the public present, Allen instructed Trueman to bowl at a handkerchief he had placed on the ground. Perhaps the fact that Trueman succeeded in hitting the handkerchief helped, as well as the fact that Bill Bowes was looking on and wrote a piece in a newspaper the next day that was deeply critical of Allen over the incident, but it is as surprising that ‘Fiery Fred’ did not bite back as it is that Allen seems not to have picked on Trueman on any other occasion. It would seem both were wary of the other’s reputation. Perhaps the best illustration of Allen’s lack of man management skills is his relationship with the Nottinghamshire batsman Joe Hardstaff. Although not quite in the same class as his near contemporaries Len Hutton and Denis Compton Hardstaff was a very fine batsman who averaged more than 46 in his 23 Tests despite being largely forgotten today. Hardstaff first encountered Allen when he was one of the 1936/37 tourists under Allen’s command. It seems Allen did not rate Hardstaff’s technique, and in the early part of the tour was critical of his tendency to hit the ball in the air. It is of course a valid criticism of any batsman who does so, but the way to make the point to an international cricketer is not to tersely tell him that he can’t be out caught if he hits the ball along the ground, so the relationship did not begin well. When the two men next came across each other, other than in passing, Hardstaff was the senior professional on the 1947/48 tour. At the start of the tour Allen told Hardstaff that he had to make sure that the players were back at their hotel for eight o’clock, and did not appreciate Hardstaff’s jocular retort; is that am or pm? On being told in terms it was an evening curfew Hardstaff simply ignored the instruction, considering it no way to treat grown men. Allen was furious and accused Hardstaff of insubordination. Later Allen added a charge of disloyalty after another incident. On that occasion Hardstaff’s Notts teammate Harold Butler was unfit to play against British Guiana and was showing all the symptoms of malaria. Allen would have none of it however and insisted Butler was ‘swinging the lead’ and would play. He did have malaria however and the upshot was that Hardstaff sent the Notts club a telegram suggesting they recall Butler from the tour. By the end of the tour Hardstaff and Allen must have been heartily sick of each other and the final nail in the coffin was Allen telling Hardstaff on the boat home that he would make sure he never played for England again. In a few years time, when his star had risen further, Allen could doubtless have delivered on such a promise, but in fact Hardstaff did keep his place for the first Test against Bradman’s 1948 ‘Invincibles’, although that did prove to be his final Test appearance. In 1968 Allen bought a property on Grove End Road in St John’s Wood, and his rear garden backed onto the Harris Garden at Lord’s, where he lived on in the shadow of the pavilion until 1989 when, at the age of 87, he died. He never married so the line did not continue. According to Swanton he later regretted not proposing marriage to one particular young lady in 1925. There was also a strong attraction to the daughter of a wealthy American family who Allen met on the way home from the 1932/33 tour but, tragically, she died of nephritis in 1935. After that Swanton refers to a close and enduring friendship with twice Wimbledon doubles champion Kay Stammers, but no more than that. Perhaps if Allen had married his outlook on life and other people may have been different.